In and ongoing effort to bring better health care to our patients, Firm Foundation Chiropractic (FFC) is happy to announce it is partnering with Designs for Health (DFH) to supply your supplement needs. FFC chose to partner with this particular company as a result of its commitment to industry leading standards in the field of supplements, vastly superior sourcing of ingredients, innovative medical grade supplement formulations, its commitment to provider education and its stellar customer service practices. DFH was founded in 1989 to provide nutrition counseling services for the treatment of a variety of health conditions. The success of this endeavor grew, as did the demand for nutritional products to satisfy the specific treatment needs of the company’s clinical nutritionists. 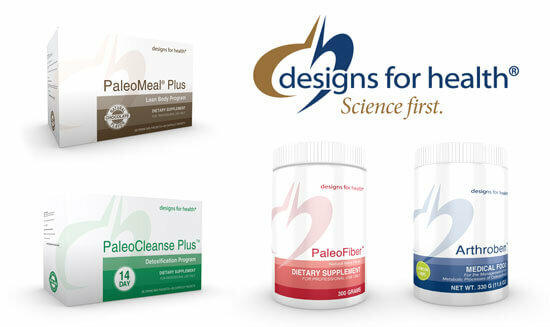 Realizing that a genuine need existed for a line of nutritional supplements designed by health care professionals, for health care professionals, DFH focused its efforts in this direction. Of utmost importance to the health professionals served by DFH was — and still is — quality ingredients, efficacious doses, and company integrity. In 1996 the company directed its growing resources toward the establishment of 3 primary divisions: Professional Products, Research and Education, and Practice Development. By holding itself to extremely high standards and delivering results, DFH has established itself as one of the fastest growing manufacturers and distributors of nutritional supplements, selling exclusively to the health professionals market. Led by a talented and committed team of professionals whose ultimate goal is to help people lead healthier lives, DFH delivers on its promise to provide the highest quality nutritional products available — and the dedicated relevant support needed to ensure optimal results. FFC will be able to meet your needs for a variety of supplements in the areas of: Brain Health, Cardiovascular & Lipid Support, Digestion/GI Health, Endocrine/Metabolism, Eye health, Female/Male Health, Foundational Health, Immunity Support, Kidney/Urinary Health, Liver Detoxification, Musculoskeletal Support, Skin Health, and weight management. Please follow up in the Healthy Living section of our website with patient testimonials for the various products from Designs for Health as well as the latest clinical studies documenting the need and benefits of supplements. Should you have any specific supplement needs or questions, please feel free to ask Dr. Davis! We look forward to helping you take your health to the next level!